The ostrich is the largest bird in the world. Even though it has wings, it can't fly, but it makes up for the lack of flight by running very fast. The ostrich is found in nature in Africa, but it is farmed all over the world for its meat. What does the ostrich look like? The ostrich is a unique looking animal. It has long skinny legs, a big body with small wings, a long neck, and a dangerous long beak. The ostrich usually weighs between 200 and 300 pounds and can grow to 9 feet tall. Its large body is covered with feathers. The males have black feathers with some white on the underside and tail. The females are usually grey in color. An ostrich's eyes can be nearly 2 inches in diameter giving them the largest eyes of any land animal. The ostrich is famous for its speed on the ground. Its powerful legs enable it to reach speeds of 40 miles per hour! Ostriches can also use their strong legs to kick a predator. It can easily kick hard enough to kill a human or even a lion. However, in most cases the ostrich will just use its speed to outrun any threat. If they can't fly, why do they have wings? The wings of an ostrich aren't used for flying, but they aren't completely useless either. They help a lot with balance when the ostrich is running at full speed and needs to change directions. 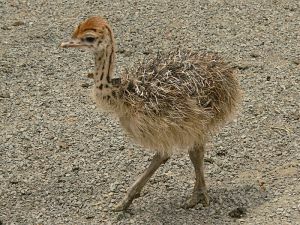 They are also used for courtship between a boy and girl ostrich. What do they eat and do? Ostriches live off of whatever they can find to eat. This includes plants, insects, and small animals like lizards. They often live in herds with other ostriches. A typical herd will have around ten birds, but some herds have been known to be as large as 100 birds. These herds help them stay safe as well. Each herd has one big nest where all the eggs are laid. This way the entire herd can help to protect the eggs. Ostrich eggs are the biggest eggs of any animal at an average of 3 pounds. Why do they put their heads in the ground? Ostriches don't actually put their head in the ground like so many cartoons like to show. What they really do is lie down and put their head and neck flat on the ground to hide. From a distance all you can see is their body, so it appears as if they have put their head in a hole in the ground. Not only can ostriches kick hard, they are armed with 4 inch long claws on their feet. The stride of an ostrich at full pace can reach 16 feet. Ostriches sometimes eat stones and pebbles which help them to digest their food. In some places, there are ostrich races where people ride on the backs of the giant birds. They even have special saddles and reins for them. The ostrich only has two toes, while all other birds have three or four.